The 408k was the first event in our Represent Running stable. It’s an 8k (that’s 4.97 miles) in the 408. You could say it’s our baby. Founded in 2011 this is the 8th Annual San Jose 408k, benefiting the Pat Tillman Foundation. After creating the 408k for the greater San Jose area, we knew we could not keep the magic to ourselves. As long as we stay true to our winning recipe: run local, connect with local charities, and listen to the people; we’ll have awesome results. – Point-to-point course with luxury bus transportation back to the start and you’re always getting closer to the finish. – The 8k distance is unique to the scene and anyone can finish 5 miles. You can do it. – The Mariachi Mile, a Mariachi band lined stretch of course. Click here to find out more: www.run408k.com. The San Jose Shamrock 5k & 10k Run/Walk benefitting the San Jose/Dublin Sister City Scholarship Program is the newest Represent Running event. The event will start and finish in San Pedro Square. Come run or walk and enjoy the awesome post-race party with live entertainment, beer garden and more. For more information got to sanjoseshamrockrun.com. The 2nd Annual Silicon Valley Half, 10k, & Food Truck 5k Festival returns to Silicon Valley’s capital, downtown San Jose on Sunday, April 28, 2019. Thirty-six-years-old, Across the Bay 12k and 415k is the second event in the Run the Bay Challenge. Across the Bay is an ode to simpler times when people came out to run on a whim, give their best and high five the finisher next to them — dudes and gals that have been around running and racing Across the Bay since the 80’s. We love Across the Bay’s 12k distance and we’re also adding a 5k to give everyone another race distance option. 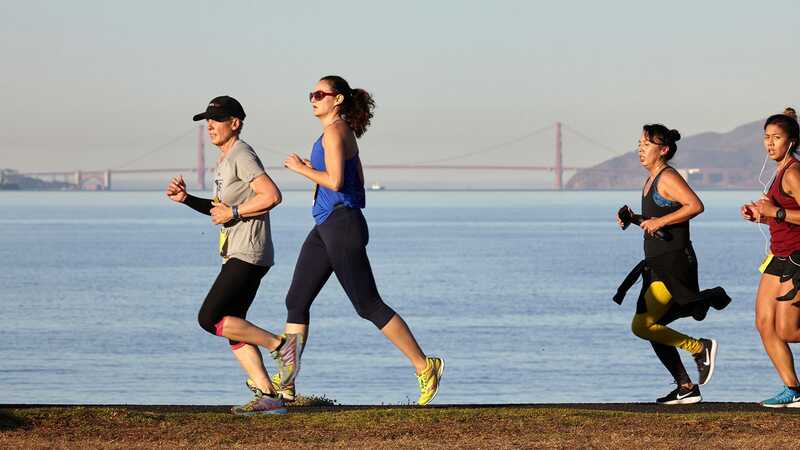 A point to point course starting in Sausalito, across the Golden Gate Bridge, and finishing in Aquatic Park. The 5k course starts and finishes in San Francisco. The East Bay 510k is the third stop in the Run the Bay Challenge Series. Both 5k and 10k events feature our updated point-to-point course starting on the frontage road by Tom Bates Regional Sports Complex and finishing at Bay Street Mall. For more information or to register please visit www.EastBay510k.com.